It has been a while. I have found getting back into the swing of things these past two weeks has been difficult. I have been looking forward to the Spring because I was really hoping that life would start to slow down a little bit. It hasn’t. If anything, I think we are busier now than we were in the Winter. And to think, I’m not balancing school right now on top of work! There has not been much creativity around here. I have managed to paint my wheel with the first coat of oak stain – but I forgot my camera at home (the wheel is currently living in Mom & Dad’s garage) so I can’t share what it looks like just yet. The oak stain, thus far, is warm – I’m very happy with it. It has been a long time coming but I wanted to share a couple of finished project photos of o w l s by Kate Davies. 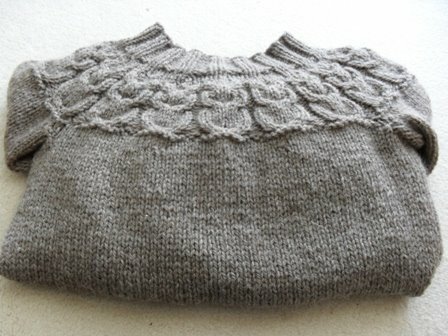 I knit this very quickly and finished over two months ago. I have not worn it and plan to rip it out to re-knit it this summer. The pattern is a-m-a-z-i-n-g. Kate did a great job and I would not shy away from knitting another Kate Davies pattern – I would probably rush right in again (just like I did this time). However, because I rushed in and didn’t take into consideration that I don’t have broad shoulders and don’t need a lot of waist shaping … well, it has ended up bagging out so much between my shoulder blades that it unwearable. Ironically, when I turn the sweater around and wear it backwards, the “problem” is fixed. So, that is what I am going to do next time: knit two fronts by omitting the waist shaping. My favourite store bought pullover sweaters have no waist shaping so why meddle with a good thing? I chose to knit this in Cascade Ecological Wool in colourway 8063 (brown). It’s very gray, which I love and it was a good choice for this project. Gauge was slightly off though, so be forewarned to need to take that into consideration but I would definitely chose it again. I suppose I should get back to work … may everyone have a good Victoria Day long weekend!